Tile is one of the most durable and versatile flooring options out there, making it a great water-resistant option for bathroom floors. Ceramic tiles are often glazed with a protective layer, which means they are less likely to absorb liquid and stains. Tile and grout are often sealed once they’re installed and this extra step is what helps keep dirt and mildew at bay (especially in humid and damp spaces like bathrooms). On top of its durability, tile is also easy to keep clean. Follow these general cleaning tips and your new bathroom tile floors will keep looking like new for years to come. All you need to do to keep your flooring looking great is clean it regularly by sweeping and mopping with warm water. If you have tile walls in your bathroom, the same method applies. Just use a soft rag to wipe down your tile instead of a mop. You can add a bit of mild detergent to the water for a little extra oomph, but it isn’t necessary if you’re cleaning your tile at least one time per week. After mopping, follow up with a microfiber or lint-free cloth to dry the surfaces. 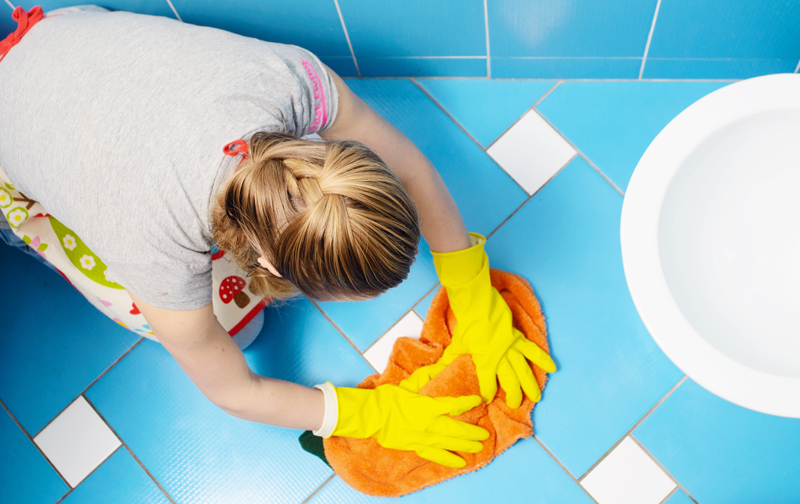 Is your tile still looks dirty, even after cleaning? Make sure to dry your tile thoroughly after mopping to keep dirt and dust from sticking to its wet surface. Grout needs to be cleaned too, and it requires different care than tile. Unlike ceramic tile, grout is porous, and it can more easily collect dirt, stains and mildew. If you clean your tile but neglect the grout, your floor may not look as clean as it should. Use natural cleaning products like vinegar and baking soda, or products meant for grout. Check your manufacturer’s recommendations before beginning. Not doing so puts your grout and tile at risk for bleaching or staining. Sprinkle baking soda over your grout, and follow with vinegar. Use a toothbrush to work on any particularly difficult areas. Once the solution has bubbled, rinse well with clean water and dry with a lint-free cloth. Before establishing a new tile-cleaning routine, refer to your tile manufacturer’s warranty because certain products may be recommended (or advised against) for tidying up your tile. Did you purchased your tile from Kermans? We can help you find your manufacturer warranty. Call our store at 317-842-5700. Having your tile and grout properly sealed upon installation and resealing when necessary will help your grout stay clean, but it’s important to clean it regularly too. As with any cleaning regimen, consistency is key. Regular cleaning will help keep your bathroom tile clean, avoid any staining on the grout, and extend the life of your floors. Use this schedule as a guide for keeping your floors sparkling. Sweep or dust at least once per week. This will keep dirt and debris from collecting and scratching the surface of your tile over time. Mop with clean water after sweeping. Remember to wipe up spills as they happen, especially if the spill flows onto the grout lines. Take a closer look at your tile about once a month. Look for larger scuffs or other damage, and check the grout and sealant for signs of wear and mildew. For large scuffs, use a damp cloth and scrub gently to remove. If your manufacturer’s warranty allows it, try a mixture of baking soda and water for removing tougher marks. On a regular but more infrequent basis, you should review your warranty for recommendations regarding tile and grout sealant. Generally, sealants should be reapplied every few years to keep your floor beautiful and damage-free. Have more questions about picking out bathroom tile that is easy to upkeep? We can help. Schedule a free consultation with our design experts today. At Kermans, we have something beautiful for every budget.